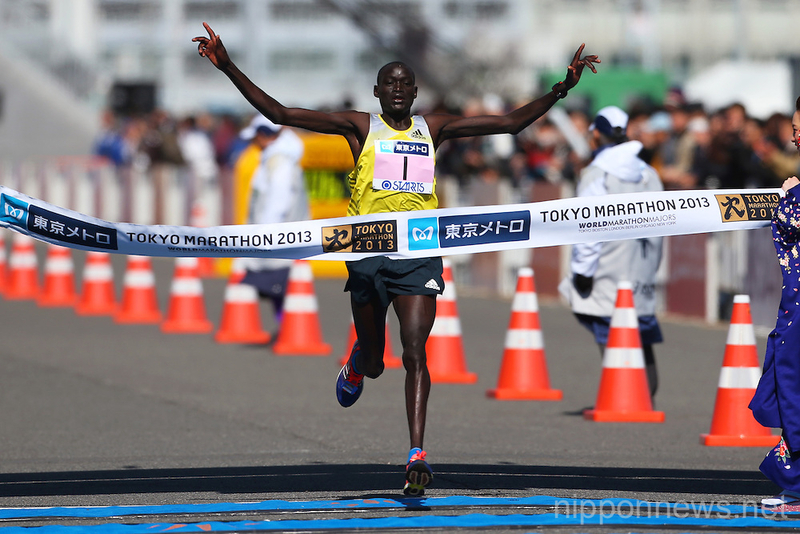 Kenya’s Dennis Kimetto wins the 2013 Tokyo Marathon in course record 2:06:50. Berlin runner up and the fastest man to never win a marathon, Kenya’s Dennis Kimetto, can now remove that caveat after winning the 2013 Tokyo Marathon in a new course record 2:06:50. Kimetto was the strong pre-race favourite in the best field ever assembled for a Tokyo Marathon, a reflection of its upgraded status to a World Marathon Major. Known as a strong finisher, Kimetto hung with the lead pack through halfway in a modest 64:22 until putting in surges of 14:20 for the 5km between 30 and 35km and 14:35 to cover 35km to 40km mark. He was followed by compatriot Michael Kipyego and had a six second gap at that mark, but Kimetto then kicked to cover the last 2.195km in 6:34 and break the course record by 33 seconds. Kipyego, the 2012 winner, also snuck in the course record finishing in 2:06:58. The Kenyan trifecta was completed when Bernard Kipyego crossed in third (2:07:53). Kimetto, who will move to the top of the World Marathon Majors leader board with his win, now has his sights set on greater accomplishments. ‘Maybe I can go to the world championships or Berlin,’ Kimetto said. The course record was even more impressive considering the race was held in blustery headwinds that affected many of the runners. On the women’s side it was Ethiopia who claimed bragging rights, with Aberu Kebede crossing first in 2:25:34 and compatriot Yeshi Esayias second in 2:26:01. The fastest female in the field, Germany’s Irina Mikitenko crossed third in 2:26:41. How do you follow up a marathon debut that netted you the second fastest time of 2012 over the distance? 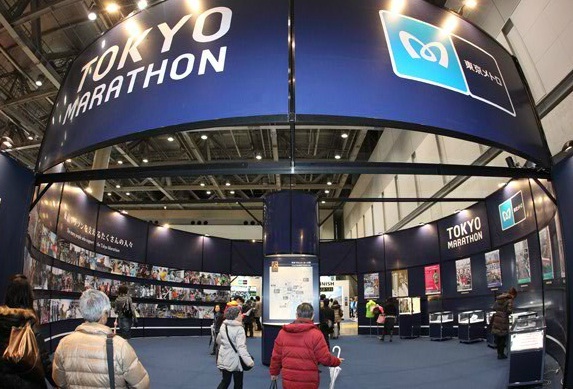 For Kenya’s Denis Kimetto the aim is to ensure that even if the time is not faster, he moves up from second to first and wins his first marathon at this weekend’s Tokyo Marathon. Kimetto has run the fastest marathon not to win and aims to change that in Tokyo. Kimetto, who finished second behind mentor and countryman Geoffrey Mutai at last year’s Berlin Marathon, is the headline runner as Tokyo makes its debut as an official World Marathon Major. He came under some criticism for not challenging Mutai for the win at Berlin, however at Tokyo crossing the line first will be his number one focus. ‘After my debut in Berlin, it is time I go on my own and Tokyo is ideal for me. 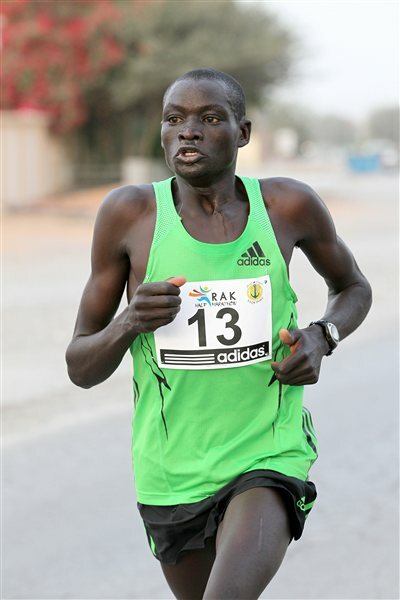 I want to win a marathon and build on it as I start my career in the discipline,’ Kimetto said. ‘It will not be easy because, Mutai will not be running with me. He has been a mentor and father figure to me. I started training under him and we have remained together. ‘I know I have a lot of challenge ahead for me in Tokyo. My time in Berlin last year was great, we were eying the world record (2:03.38) but we were not up to the task. ‘But I have a statement to make in Tokyo and depending on the weather, we will see how fast it will be,” Kimetto added. Alongside Kipruto, there will be defending men champion Michael Kipkorir Kipyego (2:06:48), 2:04:27 runner James Kwambai and 2:04:56 finisher Jonathan Kiplimo Maiyo. Other hopefuls include Eric Ndiema (2:06:07), Gilbert Kipruto Kirwa (2:06:14) and Daniel Njenga (2:06:16), Bernard Kiprop Kipyego (2:06:29), Japan based Josephat Ndambiri (2:07:36) and Gideon Kipketer (2:08:14). The race will also double as a qualification opportunity for many Japanese runners hoping to head to the World Championships in Moscow later this year. Arata Fujiwara, Kazuhiro Maeda and Takayuki Matsumiya – who finished second, sixth, and seventh respectively last year – return to Tokyo in an attempt to qualify for the IAAF World Championships. Yoshinori Oda, who finished fourth two years ago, will also be in contention for selection, but perhaps the most promising domestic runners are Masato Imai and Yuki Sato. 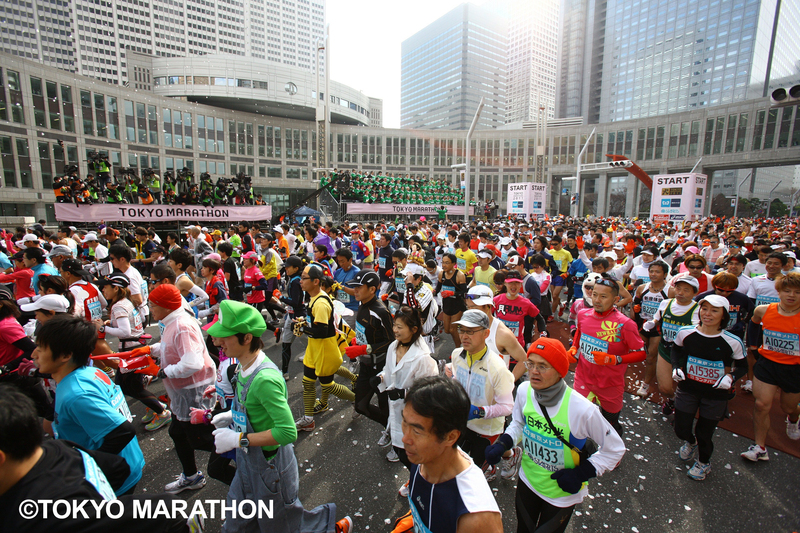 Imai’s best time is 2:10:32, but his aggressive racing style has attracted a lot of praise, while Sato is the most anticipated Marathon debutante in years. His 10,000m best, 27:38.25 is the fastest among active Japanese runners. On the women’s front, German Irina Mikitenko boasts the fastest PB of the field with her 2:19:19 from 2008 but the Ethiopian duo Bezunesh Bekele and Aberu Kebede, who both recorded PBs of 2:20:30 last year, are the favourites. Bekele won the Dubai Marathon back in 2009 but set her PB in last year’s edition of the race when finishing fourth. Kebede finished just three seconds behind her on that occasion, but later in 2012 she matched Bekele’s PB (2:20:30) when winning the Berlin Marathon – her second victory in the German capital, having also won there in 2010. So after a few months of consistent, injury free training fate finally caught up with me over the weekend in the strangest of ways and the result is a mild case of bursitis. All was going well, I’d put in a solid 10 mile run on Saturday morning with five at tempo. After some ongoing work on our house renovation I had taken my 18 month old daughter to her swimming lesson. I was in the pool with her when somehow, I’m still not quite sure exactly how, I managed to bang my left knee on the bottom of the pool. Later that day it had bruised up but I was pain free and didn’t really think any more of it. Come Monday morning I woke up early and put in an easy five miler with no dramas. Then I stretched and showered and the pain in my knee began. As the day progressed it worsened and my knee was visibily swollen. It was painful to walk or stand on it. I was getting sad. A visit to my friendly physio yesterday confirmed that there was indeed an injury, although hopefully not to serious. 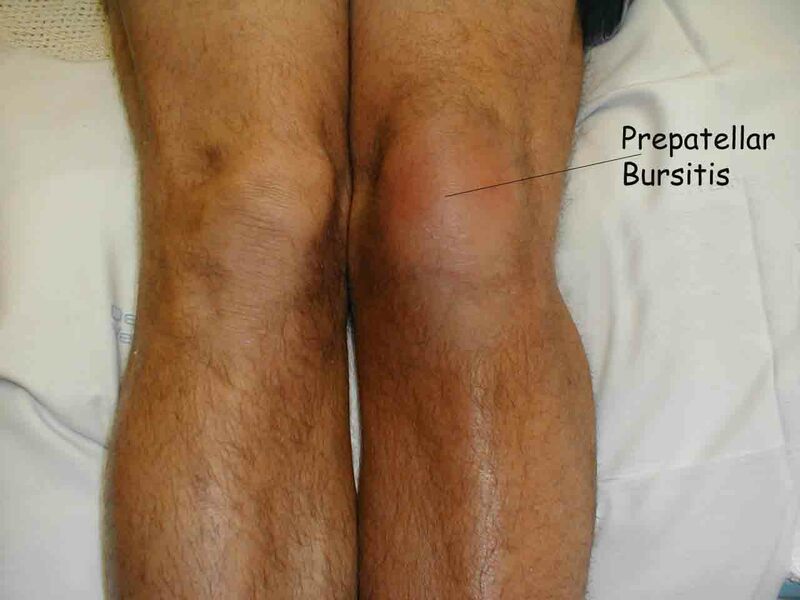 His diagnosis was an inflamed bursa, or patella bursitis, with inflammation at the front of the knee cap. No running for a week. Boo. The main treatment seems to be rest, but maintaining movement in the joint, regular icing and some oral ibuprofen to help decrease the inflammation. In some cases if there is fluid on the joint it can be drained or if pain still persists a cortisone injection can be administered, but it doesn’t look necessary for me at this stage. While at the physio I had some light ultrasound applied which apparently can help in some cases – hopefully me! Bursitis can affect any joint in the body but is commonly experienced in the knee, elbow, shoulder, fingers or hip. The injury itself is actually the swelling and irritation of a bursa, which is a fluid-filled sac that acts as a cushion between a muscles, tendons, and joints. The inflammation can be caused by overuse or by trauma. Once the initial treatment is effective and pain and symptoms are reduced then patients are able to start on strengthening exercises to minimise the chance of recurrence. Have you suffered bursitis before? Any tips or tricks to speed up treatment?